Filmmaker Andrew Shapter craves traveling streets down which he’s never been, and taking you along for the ride. In 2005 as an homage to his late, brother John, a musician who lost a long battle with cancer, Shapter set out to make a film about how the music industry lost its soul to the almighty dollar. Not only was Before The Music Dies his first film, but it also turned out to be a prescient observation of the fate of major record labels, ringing true with musicians and fans alike. Five years and two films later, Shapter’s latest documentary “Happiness Is…” finds him traveling down yet another road. This time it’s the one to…well…happiness and asking how and where we as human beings spend our time searching for it. On the eve of a multi-city tour, that will most certainly bring his film to a town near you, Shapter sat down to talk about his influences as an artist, the challenges of being an independent filmmaker, what he loves most about making movies and what makes him “happy”. I’m curious. I’m visual. I can usually see a project in my mind and if the ideas stick around long enough I have to see them through. What is your goal as an artist? Why do you create? My goal is to teach myself how to do things that I’ve never done before and if I get a second chance to do it again, such as another film, I want to do better. It’s an uphill climb, always and the day it’s no longer a challenge is a day that my creativity comes to an end. Picasso – for his never being satisfied with his own work. Pedro Almodovar – for making films his way and for making them better every time. Ken Burns – for keeping our history alive and leaving no stone unturned. How did you get started as a filmmaker? Why film? I’m not sure why. I just knew that I wanted to direct experimental films since I was a little boy. I started in photography so I could work solo while learning lighting and cinematography. Then, I gradually picked skills on producing and fund-raising. Is fund-raising the most challenging part for you of the filmmaking process? Fund-raising in a bad economy. What do you love most about making films? The entire production process is a thrill because there is so much action going on from the first frame to the last. A film is essentially a thousand decisions that come together over time. What you do with those decisions will determine how good your film is in the end. Cut corners and it’ll show. Take you’re time and think about each decision and you’ll see great results. When filming “Happiness Is…”, what did you find were some major stumbling blocks that people encounter in their search for happiness? We have a habit to comparing one another. In America (especially) we tend to compare ourselves to those around us or those we look up too. It can make us feel like a lesser person when we compare ourselves to people that are younger, wealthier, taller, skinnier or whatever. It’s a bad habit unless we compare ourselves to those who have less. We assume that happiness is something that can be pursued when in fact happiness is already within us all. In the film you interview a broad spectrum of subjects. Who’s story was your favorite and why? My favorite story has to be Lily, the immigrant woman from that left extreme poverty behind in Mexico to join her family here in the States. Her family moved to Yakima Valley and worked long hours in the apple orchards. A few years after she settled in, she lost her father after he was poisoned from pesticide exposure. She turned her loss into a call to action. She focused her energy on her education, earned scholarships and later became a physician. Now as a doctor she educated the immigrant community on how to protect themselves from pesticide exposure. I learned to accept my imperfections. There are some that just won’t go away so I’ve accepted them, and in a weird way, I’ve even grown proud of some of them. But generally, I need to improve in several areas. Don’t we all? So I guess my New Year’s resolution would be 1. Remember more faces 2. Remember more names 3. Listen closer 4. Look Closer 5. Learn more 6. Think more 7. See more 8. Care more 9. Share more …..And then take it all in. At home. In my garden. Walking with my wife. Doing homework with my kid. Hiking with my unemployed house-mates (my dogs). Helping people out. Making movies…oh man, I guess I’m pretty happy. What is the best piece of advice you could impart to a filmmaker just starting out? I would do my best to remind them that there are no rules. There are textbooks that can teach you some film history but when it comes to making your own film? There are no rules. You learn by doing. There are chapters in film history books dedicated to those filmmaking pioneers that broke away from the normal structures and traditions of filmmaking. 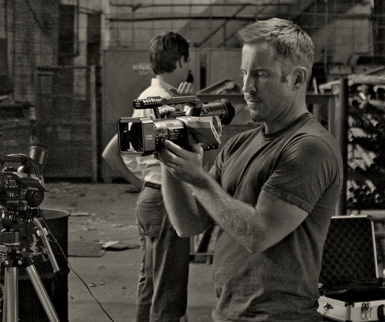 Filmmakers that explore new ways of making a film are the one’s that will go down in history. What’s next? What projects are you currently working on? I’m working on a documentary about two lovers from a small town in Texas that disappeared into thin air. Their story fascinates me and I’m going to try connecting the missing links with the help of some retired detectives that originally worked on the case. When he’s not on the road or making films, Andrew Shapter is a regular contributor to The Huffington Post and lives with his wife, his daughter and his two unemployed housemates (dogs) in Austin, Texas. Posted on February 1, 2010.